Last day for the Diversity Data Survey – We need you! Rickson Rock Opera and Coco Love Alcorn! Looking back on the story of our collaboration with Coco Love Alcorn here on this video! Thanks to Mr. Duncan for organizing it and for Heather Loney for capturing the story so well! Rickson Ridge is looking for some more Lunch Supervisors for April 15 - June 9th. If you have one hour you could spare, either regularly or occasionally, please let us know! We can be flexible with days of the week if you would like to be part time! Reminder @RicksonWolves ! The Literary Contest application deadline is Mon, March 25. The theme: is 'Fear of the Unknown". 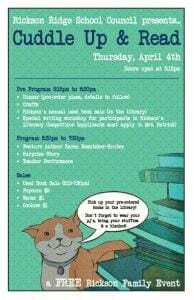 Applicants are invited to an exclusive writers workshop with the guest author at the Cuddle Up and Read event. Wondering How to Help Your Child With Math? Get your dancing shoes ready! 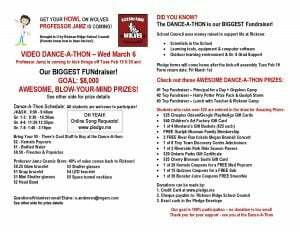 Only 2 more sleeps until the Dancethon! Our amazing Mr. Farmer with a message for everyone! Stay safe and keep warm today and we'll see you back at school very soon! Danceathon Kick-off Assembly is Today! Today Professor Jamz is visiting to kick off our Danceathon! Ask your child about the exciting event to come! Rickson Ridge Public School. Part of Upper Grand District School Board. All rights reserved.